Creamy, spicy red curry sauce is a staple of Thai cuisine, and you'll often find it mixed with vegetables, fish or tofu and served atop a steaming bed of rice. While red curry sauce is healthy in moderate portions, it can be high in fat and calories thanks to the addition of coconut milk. At home, use light coconut milk to keep calories to a minimum. 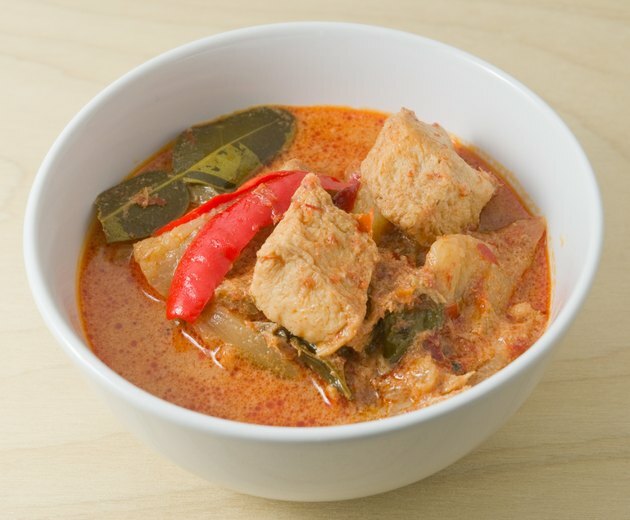 Prepared red curry sauce may contain about 90 calories per 1/4 cup, so if your meal is swimming in sauce, you could consume hundreds of calories. Red curry paste, which provides most of the sauce's flavor, contains just 21 calories per serving. However, regular canned coconut milk contains a hefty 420 calories per cup. Light coconut milk contains a more reasonable 150 calories per cup.